Martin Winterkorn, who was appointed VW CEO on Jan. 1, 2007, wants Europe's largest automaker to become the world's largest automaker by 2018. FRANKFURT (Bloomberg) -- Volkswagen AG extended CEO Martin Winterkorn's contract by five years, giving the executive time to complete a merger with Porsche Automobil Holding SE and surpass Toyota Motor Corp. as the world's biggest carmaker. VW's supervisory board unanimously backed the CEO's appointment through 2016, the Wolfsburg-based company said Sunday. Winterkorn, 63, took over as CEO on Jan. 1, 2007, and his current contract expires at the end of this year. Under Winterkorn, Europe's largest carmaker added Swedish truckmaker Scania AB to its portfolio and is now merging with Porsche, maker of the 911 sports car. The CEO plans to double production capacity in China with two new plants and open a factory in the United States this year as he seeks to beat Toyota in sales and profitability by 2018. Porsche's preferred stock rose as much as 16 percent in Frankfurt trading, the biggest intraday gain in 21 months, after a U.S. judge dismissed two lawsuits on Dec. 30 that were tied to the sports-car manufacturer's failed hostile attempt to buy VW in 2008. The automakers have since agreed to combine, with Porsche becoming VW's 10th brand. Volkswagen aims to sell more than 8 million cars by 2012 and 10 million as early as 2015, three years earlier than a 2018 official target, a person with knowledge of the matter said in October. Fueled by demand for models including the VW-brand Golf compact and Audi A7 coupe, 2010 deliveries may exceed 7 million vehicles for the first time, compared with 6.29 million cars, sport-utility vehicles and vans sold in 2009, sales chief Christian Klingler said on Dec. 10. VW's preferred shares, which have replaced the common stock on Germany's DAX Index since the Porsche deal, rose as much as 5.40 euros, or 4.5 percent, to 126.80 euros and were up 3.3 percent as of 12:34 CET in Frankfurt. The stock, which has more than doubled since the beginning of 2007, gained 86 percent last year, the best performance in the benchmark index. Porsche gained as much as 9.68 euros to 69.34 euros, the biggest jump since April 2, 2009, and was up 14 percent. Winterkorn ranked first in a semiannual poll published yesterday by Wiesbaden, Germany-based consulting company MC IT Solutions GmbH of 1,000 managers asked to rate the country's top 15 executives, beating Deutsche Bank AG CEO Josef Ackermann and Daimler AG CEO Dieter Zetsche. He also topped the previous survey, released in mid-2010. Nine-month net income jumped fivefold to 3.78 billion euros ($5 billion). In November, Toyota raised its profit forecast, saying net income may total 350 billion yen ($4.3 billion) for the fiscal year ending in March. Volkswagen plans to invest 51.6 billion euros in the automotive business over the next five years. The expansion relies on success in China, where VW is adding factories to double production to 3 million cars within four years. Winterkorn, who previously ran VW's Audi luxury unit, took the top job from Bernd Pischetsrieder, who was ousted less than a year after receiving a contract extension. German supervisory boards typically decide whether to keep their CEOs a year before the contract's end. On Sept. 8, Osterloh told workers at the carmaker's headquarters that Winterkorn would receive a contract extension. Winterkorn aims for a pretax profit as a proportion of sales of more than 8 percent in 2018. VW's nine-month pretax margin was 5.9 percent. Toyota City, Japan-based Toyota had a first-quarter margin of 5.4 percent. The CEO has the backing of Lower Saxony, the German state with a 20 percent stake in the carmaker and the power to veto major decisions. 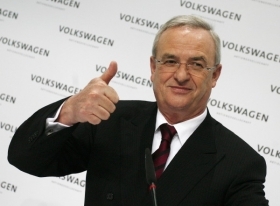 “We support Martin Winterkorn's ambitious goal to make VW No. 1 in the auto market worldwide by 2018,” Prime Minister David McAllister told Bloomberg News in a June interview. Volkswagen paid $2.5 billion for a stake in Suzuki Motor Corp. in January 2010 to expand in India and is taking over Porsche's sports-car business, adding to VW marques that include Skoda, Seat and luxury brands Audi, Lamborghini and Bentley.